Brighton is located within easy reach of all four of London's international airports, Heathrow (LHR), Gatwick (LGW), Stansted (STN) and London City Airport. These popular airports are all less than an hour from London city centre and you can travel into London by either express trains, coaches, buses or by car. 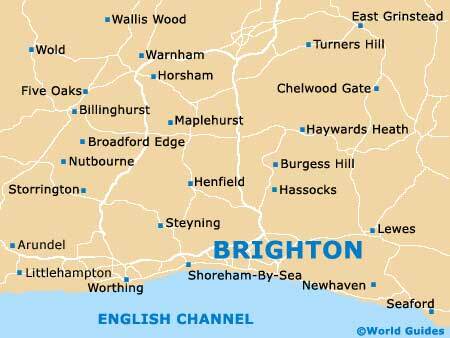 Brighton is easy to reach from all of these airports or from the centre of London, by either car, coach or train. London Heathrow Airport (LHR) is situated 114 km / 71 miles from Brighton. Heathrow airport is one of the world's busiest international airports, with excellent passenger facilities, including many restaurants, fast-food outlets, shops and large duty-free outlets. Getting into Brighton from London Heathrow Airport couldn't be easier. The airport has good connections to nearby motorways and the new Heathrow Express trains take about 15 minutes to reach Paddington station, which has regular trains travelling to Brighton. Book your London LHR Car Rental here. At the airport terminals there are several car parks available, including long-term parking. A shuttle bus connects the car parks to the terminal areas. Gatwick is London's second airport and is one of the busiest in Europe. Situated some 49 km / 31 miles from central Brighton, Gatwick has many excellent passenger facilities, including conference and business centres in the south terminal. Non-stop 24-hour Gatwick-express trains run between the airport's south terminal and Victoria station, taking around 30 minutes. There are other cheaper services, but these do not depart as regularly and make stops on the way. Flightline coaches depart hourly from Gatwick's North and South terminals and arrive at Victoria Coach Station in around an hour and 15 minutes, but do not run during the night. If you wish to rent a car, there are many well-known car rental companies represented at the airport. Book your London LGW Car Rental here. The newest and most modern of London's international airports. Stansted lies 158 km / 98 miles km from Brighton. London Stansted Airport is served by the Stansted Skytrain to Liverpool Street, which runs daily and takes about 45 minutes, but does not run at night. Flightline coaches also run every hour from Stansted to Victoria Coach Station. These are cheaper and make several stops along the way, including Finchley Road and Marble Arch. Book your London STN Car Rental here. London's fourth airport is situated in the Royal Albert Docks, 89 km / 55 miles from Brighton city centre. The airport only handles European flights and is connected by shuttle bus to Canary Wharf and Liverpool Street. Book your London LCY Car Rental here. Luton Airport is situated near Luton, 10 miles / 16 km from the M25 motorway and is 159 km / 99 miles from Brighton. Book your London LTN Car Rental here.